Among service companies of the West Siberian region of Russia, that provide oil recovery services to the state oil producing complexes, one of the leading places is occupied by ZAO “SP “MeKaMineft”, established in 1992 with the participation of the Megionneftegaz Production Association, the German company Cat.oilGmbH and the Belgian financial company MikoFinanceandTradingCompany. The basis for such success is a powerful production and technical facilities, highly qualified personnel, modern methods, world-level technologies and equipment. Together, this allows a wide range of works on the secondary impact on the reservoir to increase its productivity. In order to implement them the company owns 7 production sites, 14 hydraulic fracturing manufacturing complexes, including 2 complexes equipped with "flexible pipe" with a pumping unit in one assembly, a large base of production services in Megion, as well as 1,550 staff members. In addition to the traditional hydraulic fracturing, ZAO “MeKaMineft” successfully implements and applies new technologies to efficiently extract oil from low-permeability reservoirs: foam-nitrogen fracturing, STEPWISE FRAC (hydrosand-blast perforation with hydraulic fracturing), multi-phase fracturing. Company has a wide range of different solutions, such as deeply-penetrating formation hydraulic fracturing and hydro-sandblast perforation of the borehole, bottom-hole formation zone treatment with demulsifiers and various acidic components, well development by swabbing method, lost circulation treatment of the wells equipped with electric submersible pumps; wellbore clean out and well injection capacity restoration, Coiled Tubing unit service, etc. The use of new technologies makes it possible to significantly increase the oil recovery coefficient (ORC), involve remote, weakly drained deposit sections, significantly reduce the production time, successfully carry out fracturing operations in wells with the existing danger of breaking into the water-saturated part of the reservoir. ZAO “SP “MeKaMineft” company does not stop there and is looking for new ways to improve existing, as well as newly introduced technical solutions. In particular, ZAO “SP “MeKaMineft” has a positive experience in hydraulic fracturing with the use Christmas tree protector. The Christmas tree barrel (a hollow rod with seals on the outside diameter) is introduced into the tubing string through the wellhead channel. The supply of process fluid to the tubing string is carried out directly through the Christmas tree, thereby excluding the effect of operating pressure on the X-mas tree assembly. The company's specialists have repeatedly provided qualitative assembly and dismantling services with the use of their own special hydraulic fracturing machinery provided both by ZAO “SP “MeKaMineft” and other service organizations that perform formation hydraulic fracturing. Special attention is given to the establishment of healthy and safe working conditions, based on the principle of the priority of preserving the life and health of employees in relation to the results of production activities, ensuring the reliability of hazardous industrial facilities. At present, ZAO “SP “MeKaMineft” obtained a license to carry out explosive and chemically hazardous production facilities of I, II and III hazard classes and a certificate of registration for the permission to operate hazardous industrial facilities, which is evidence of the Company’s compliance with all regulatory requirements, technical documents in the field of labor protection, fire and industrial safety. Performing work on oil, gas condensate and service wells, ZAO “SP “MeKaMineft” sets a goal to provide high-quality services that meet the state, international requirements and expectations of customers; maintain a leading position in the Russian market, carry out long-term production development, production objects reconstruction and modernization, as well as improving the welfare of employees. Achieving these established purposes the company management does not forget about adverse environmental impact reduction due to minimization of harmful influence on nature by all accessible and reasonable means. Enterprise production activity includes the Khanty-Mansiysk Autonomous Okrug-Yugra, the Yamalo-Nenets Autonomous District and the Orenburg Region. The main customers of ZAO “SP “MeKaMineft” are: OAO Slavneft-Megionneftegaz, OAO Rosneft-Yuganskneftegaz, Gazpromneft-Khantos LLC, OAO Gazpromneft Gazpromneft-Muravlenko branch, Lukoil-Western Siberia LLC. Their trust is completely warranted due to day by day service improvement. It is also worth noting that the activity of ZAO “SP “MeKaMineft” is based on honesty, quality and commitment to excellence. This is the key of successful development of the enterprise and beneficial cooperation with it. In 2011, ZAO “SP “MeKaMineft" conducted a certification audit for compliance with international standards ISO 9001: 2008, ISO 14001: 2004 and OHSAS 18001: 2007. Having reviewed the results, the group of auditors noted that the company uses excellent manufacturing practices related to the quality of its services, health and environmental protection. 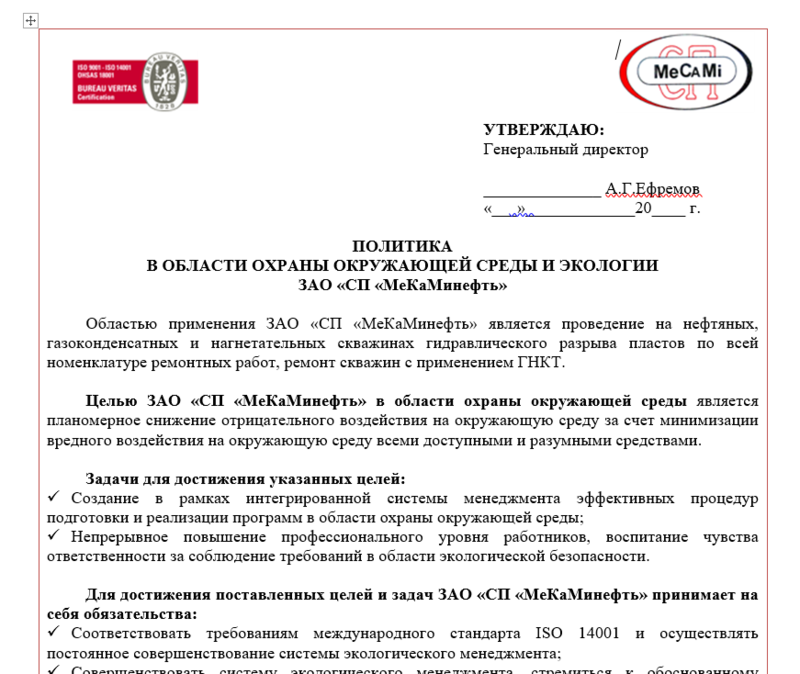 In May 2011, based on the results of the certification audit ZAO “SP “MeKaMineft” received certificates of compliance with international standards. In 2012 and 2013 supervisory audits were conducted, and in 2014 - re-certification, during which the company confirmed its compliance with the high standards of the standards listed above. 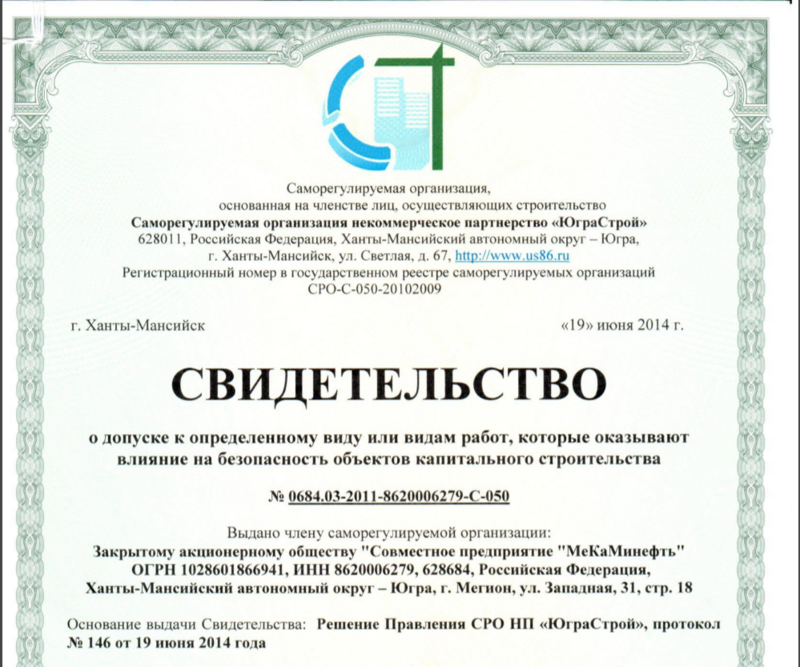 According to www.business-rating.net ZAO “SP “MeKaMineft” is in the top ten “Industry leaders-2015. 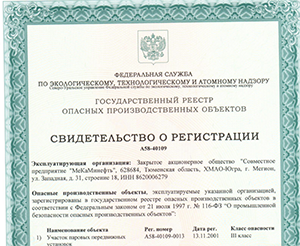 National rating of the Russian Federation. Group AAA (the highest level of reliability)” among the companies that provide services related to the oil and gas recovery. Thus, for 23-year period ZAO “SP “MeKaMineft” has made a long way from a small enterprise to an independent production unit with a large potential and a powerful infrastructure with a wide range of services. The company has a highly qualified staff and modern machinery for hydraulic fracturing, which allows it to successfully compete with similar enterprises. Today MeKaMineft is one of the leading organizations of the Fuel and Energy complex in the sphere of rendering services to increase crude-oil production.